Well, WonderCon's wizzed past for another year, and in it hundreds of fans dressed up in their favourite cape and cowl, to strut their stuff for all to see. Putting aside the usual army of Batmen, Wolverine's and Wonder Women, here are seven of the best cosplay outfits from the event, thanks to the amazing photogallery of Onigun. What's better than the Black Widow? Nothing you say? Darn right. 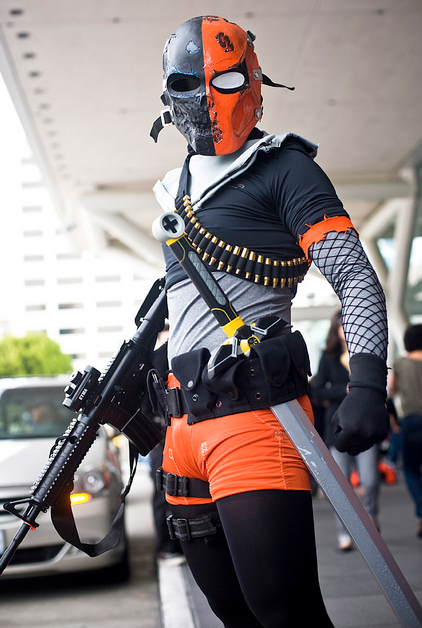 Deathstroke is a great choice and the skull imprint on the mask really kicks this one into overdrive. As Catwoman and Bane show below breasts were on show almost as much as sci-fi this year - Captain America however rises above it all 'We are not amused'. Silk Spectre and Rorschach prove you can't define comic book cool without 'Watchmen'. 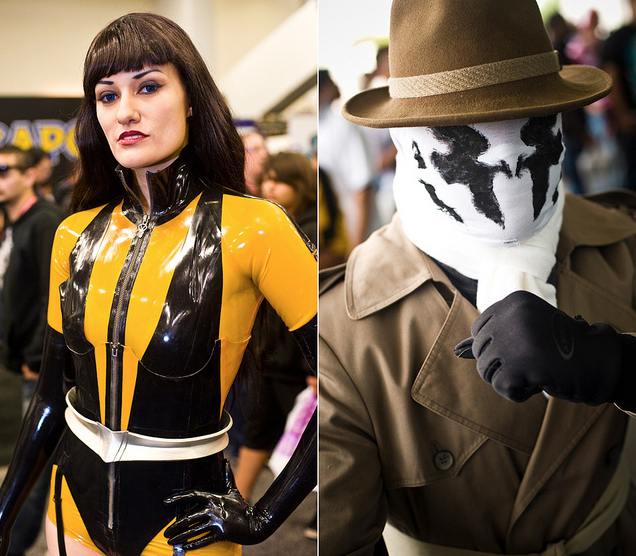 For many more great professional snaps of cosplayed-out fanboy's and girls, click the jump. i live right across The Bay from where this Wonder Con took place. why did i not go and find those women in the Black Widow and Catwoman costumes and get their phone numbers? I think that's the fastest comment IADW has ever received Dave! You must've been loading the site as soon as I hit 'publish'! Maybe I need more posts of buxom Black Widows to encourage comments! What do you reckon? "so let it be writen, so let it be done." That's why you didn't see it David. When you passed they were on the changing room. Aliera, I think you're right, but it looks to me like they each wore half the costume on the day of the con. Dave, Dan, take a look at the rest of the album. My money's on Ms. Marvel, but that's just me. They had a whole set of Henchmen! From the Venture Bros! HAHAHAHA! I totally would have been following those guys around the entire time, looking for signs of Brock Sampson. And I really loved the Kyoshi Warrior Costume, it was really well put together. But I agree Craig, the Ms. Marvel was gorgeous. And if you're going for babes, she was top of the line. I also thought that Brightest Day Hawk Girl was pretty nifty looking, down to the creepy contacts. That's called costume completion, right there. Speaking of, I thought that Bishop's eyes were well done too. The tattoo looked poorly drawn, which brought the costume down for me. The Hawk Girl was the best of that Brightest Day group. Glad you guys checked out the rest of the album! It's definitely a great bunch of photos and some pretty sweet shots for sure. Iron Girl was interesting, but Ms Marvel - well who doesn't like that outfit? Love the line about costume sharing too! You guys crack me up. But now I look back I think you are all on to something! That album definitely warrants a second look. Of course it's just to make sure we've got our facts correct. so where' the rest of this bloody album!? is there a link i'm not seeing WTF? help me out here people. Haha no worries Dave - click the words 'the jump' at the end of the post or the name Onigun in the first paragraph. awesome! that Asian Mr. Marvel was something else! but my god there was also that Power Girl! she filled out that costume quite nicely to say the least. of course there so many other lovely ladies in costumes but i'll be up too late trying to give them all a shout out on this comment. but i must say there was also a woman with blond hair in this red leather clad outfit. i don't know who she was but that costume looked really authentic. it really was more like something you'd see on some sci-fi movie set that at a convention. thanks a lot Dan. i need to get some sleep but now i'm feeling restless for some strange reason. I've been trying to figure out who the hell she's supposed to be too Dave. All I could think of was one of the female assassins from the short-lived Legend of the Seeker syndicated series from about 2-3 years ago. Yeah, I'm pretty sure that's what she was supposed to be, guys. One of the Mord Sith. They were always running around in red leather in the books. Kept the blood from showing up. well where ever it came from it looked good. and it also looked good on the blond who was wearing it. she's kinda exotic looking too which also doesn't hurt. You know what Anon - you're the first person that noticed that! Corrected now - if I was vintage Marvel you'd already have a bonafide No-Prize for your efforts!